Wax currant is a compact but erect, many-branched, fragrant shrub that grows about four feet tall. The waxy, gray-green leaves are fan-shaped, generally in three to five less-defined lobes with gently scalloped edges. The often-sticky hairs on the younger branches, leaf stalks, flowers, and fruits contribute to its strong, unpleasant, carrion-like odor. Spring-blooming flowers are creamy white to pale yellow, tubular, and about half an inch long and form small clusters at the end of short stalks along the branches. The fruit is a red or orange berry about a quarter-inch in diameter. The berries are edible, although seedy and tasteless. 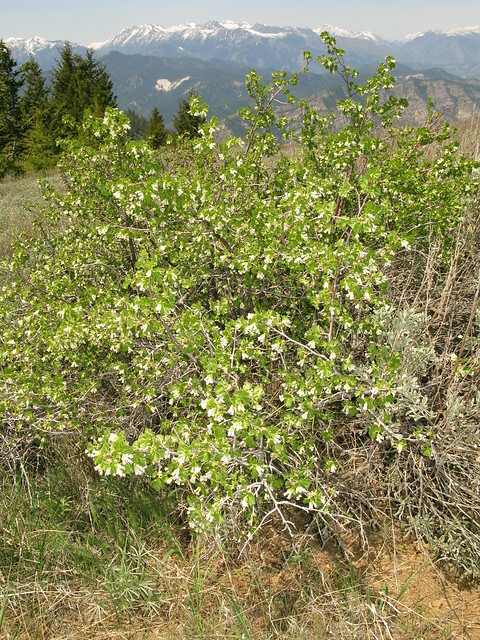 Wax currant provides food and cover for wildlife. Chickadees and other birds eat the fruit. It is not as valuable for deer, but it is used on ranges where little else is available. Native Americans used the wax currant berries for pemmican, the source of the name "squaw-berry." Eating a large quantity of the fruit may cause a burning sensation in the throat. They used the wood of the wax currant for arrow tips. An infusion of inner bark was used to wash sore eyes.